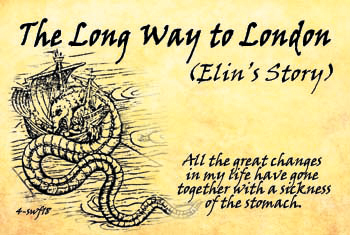 I wrote this synopsis of The Long Way to London, the first part of Elin’s Story, for the Stockholm Writers’ Festival. Read this straight through for a 500-odd word outline of the first novel, or interrupt your reading by following the hyperlinks to some background notes – and sometimes to other pages. The Long Way to London is historical fiction based on a true story. We start in Sweden in 1563 and end in England in 1565. Our principal point-of-view character is Elin, pretty, impressionable, intelligent and pragmatic. In the story she is between 13 and 15, but her voice is that of 26-year-old Elin looking back. The death of Elin’s father leaves her mother with six children to raise, four of them girls. Once important at the royal court, under the new King Erik XIV the family have little status. Still, through family connections, her mother wins Elin a position as a maid-of-honour to 24-year-old Princess Cecilia. Sweden and Denmark are at war. The journey to London starts when Elin and her family must flee the advancing Danes to seek refuge north of Stockholm. They deliver Elin to the Princess on the way. Princess Cecilia, King Erik’s young half-sister, has a cast-iron belief in herself. The beautiful, wilful Princess is already the cause of scandalous rumours across Europe. She has a fan crush on Queen Elizabeth of England, seven years her elder, and wants to visit the Queen in London. Because of the war with Denmark the sea route to England is blocked. Also King Erik swears the Princess will only leave Sweden as a married woman. At the start of Part 2, Elin as the youngest maid is everyone’s pet. Apparently giving in to her half-brother’s demands, the Princess has just married. Princess Cecilia’s husband is a German Margrave, an officer in King Erik’s army. 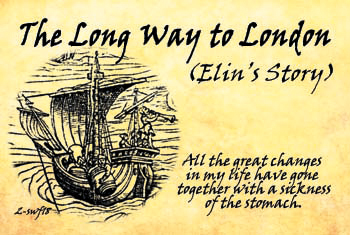 Elin witnesses the Princess’s campaign of persuasion to get King Erik to let Margrave Kristoffer take her to visit his German estates. Privately Kristoffer has promised to take Cecilia to London first. 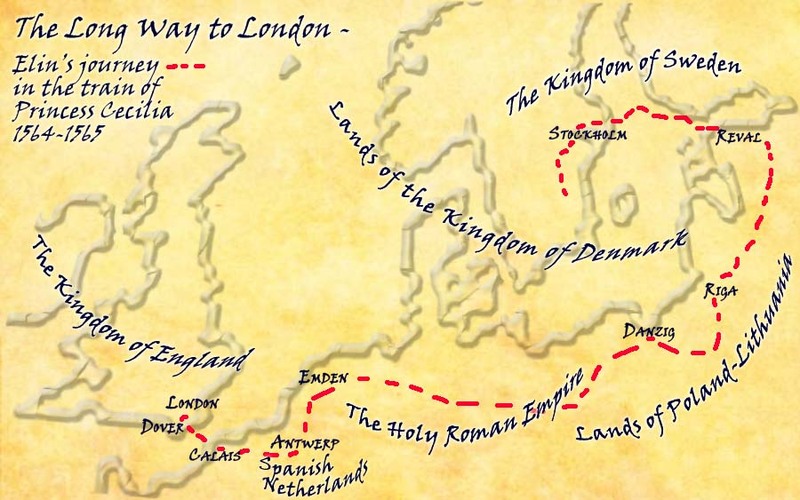 The Princess’s party sail from Stockholm in November 1564, heading east – “the long way to London”. 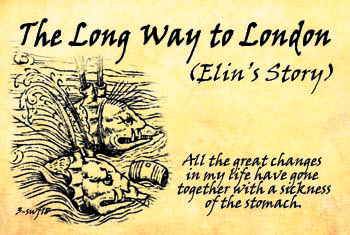 Along with the other Maids, Elin experiences the hardship of a winter voyage across the Baltic to Finland and Estonia. The Princess’s party includes her six maids, one of whom (Johanna) may be a Polish spy, and various men including George North, the Princess’s English teacher. Johanna and George are secondary point-of-view characters who bear witness to aspects of the journey that Elin cannot. The party overwinters in Reval (Tallinn), at this time a Swedish outpost in territory disputed with Poland and Tsar Ivan the Terrible of Russia. The Tsar is a former suitor to Princess Cecilia and she’s afraid he may try to kidnap her. In Reval the Princess becomes pregnant, but refuses to allow this to get in the way of her plans. With a small guard of mercenary English soldiers and the Margrave’s German bodyguard, the party sleigh across the Baltic States. They bluff their way through Poland, which is allied to Sweden’s enemy Denmark. On horseback, as spring turns to summer, they cross lands disputed between Protestants and Catholics and riven by civil war. Detained as suspected spies in Spanish controlled Antwerp, they eventually reach the French port of Calais. There, autumn storms bar their way. Prostrate with sea-sickness they cross the Channel on the third attempt. They land at Dover on 8th September 1565. Ethel Seaton (ed), Queen Elizabeth and a Swedish Princess: Being an Account of the visit of Princess Cecilia of Sweden to England in 1565 from the original manuscript of James Bell, London, 1926. Elin is the Swedish version of Helen/Helena (and even in English at this time the “H” would have been silent). Elin was the youngest of Princess Cecilia’s maids. In two letters home dating from 1566 when she was about 15 years old, she signed herself “Elin Ulsdotter”. Ul(f)sdotter was not a family name but a patronym – Elin’s father’s name was Ulf. He was a member of the Swedish Bååt family. In London Elin was courted by Queen Elizabeth’s uncle William Parr, Marquis of Northampton, (then in his fifties). Because of this, when Princess Cecilia left England in 1566, Elin remained behind as a maid to Queen Elizabeth I.
Elin’s father was Ulf Henriksson (Bååt) who died in October 1563, probably at his estate at Fyllingarum in Östergötland. Her mother was Agnes Knutsdotter (Lillie). The number and age of Elin and all her siblings is uncertain. The only one of whom we can be fairly sure is Gertrud, who was born in 1545, a year after their parents’ marriage, while Ulf Henriksson was governor of Kalmar Castle. This makes Gertrud about 18 when Ulf died. Elin and her brothers and sisters must have been younger. Elin is supposed to have been 21 in June 1571 when she finally married William Parr, so she was probably born in 1550 or 1549 and was between 14 and 16 on the journey to London. Erik Gustavsson (Vasa), was the only child of King Gustav Vasa by his first marriage. (King Gustav established the modern Kingdom of Sweden in 1523 after rebelling against the King of Denmark.) As Duke of Kalmar, Prince Erik was one of the many European noblemen with an eye on marriage to the young Queen Elizabeth of England. 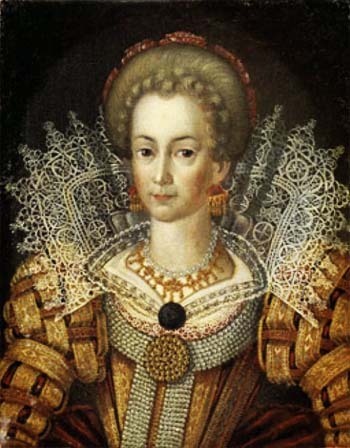 In April 1560 when Elizabeth was 26 and two years a Queen, he sent his half-brother Duke Johan of Finland to pursue his suite with her and was supposed to be on his way to England himself when his father died. 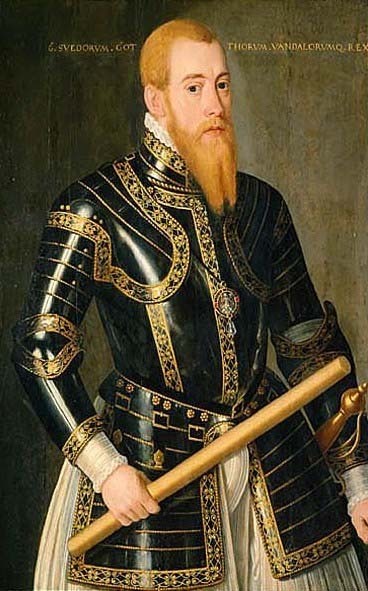 Following family policy, Erik chose to number himself “14th” (King Erik XIV) to strengthen the Swedish claim to an ancient and independent history. In truth most of the King Eriks before him were mythological. Erik was the first king of Sweden to inherit the title. The new king was keen to have the support of important men and their families, but Elin’s father Ulf retired and died at the wrong time. Alive he probably wasn’t very important, dead even less so. The senior gentlewoman in the group around Princess Cecilia was “Fru Brita” – Birgitta Hansdotter – who, like Ulf Henriksson, was a member of the Bååt family. It seems reasonable to assume that Elin’s mother used the Bååt family connection to win Elin her place. Supposed to be a portrait of Cecilia. Princess Cecilia Gustavsdotter (Vasa) was the second daughter and third child of King Gustav Vasa by his second marriage. She was half-sister to King Erik XIV and full sister to Prince Johan, Duke of Finland. Said to be the most beautiful of the Vasa daughters, she was born in November 1540, which makes her 24-25 years old at the time of the journey to London. For more on Cecilia, see this Wikipedia page. The story takes place during the early years of the Nordic Seven Year’s War (1563–1570). This pitched the major local power, Denmark, against upstart Sweden. A generation earlier, under Gustav Vasa, Sweden broke free of Danish rule, but Denmark is keen to restore its authority. For its part, Sweden under King Erik XIV is keen to take advantage of the disruption caused by the Reformation in northern Europe and to displace Denmark as the local power. Allied to Denmark is the wealthy German trading city of Lübeck, once the hub of the great Hanse trading alliance across the Baltic and beyond. Opposing Sweden, but not yet actually at war is the huge Kingdom of Poland. Friendly to Sweden – or at least neutral – are a band of German cities and states, from Prussia in the east to Frisland in the west. For more, see this Wikipedia page. When she was 19, four year before the start of this story, the Princess and her newly minted brother-in-law Count Johan of East Frisia were caught in a compromising situation – in her bedroom, and him with his pants round his ankles. Prince Erik, then Duke of Kalmar, made the situation ten times worse, first by publishing the news, then by torturing Count Johan while holding him in prison. The incident, known as Vadstenabullret – the Vadstena Rumble – was the talk of the country and the courts of Europe. See Cecilia’s Wikipedia page. Cecilia’s brother Prince Johan, Duke of Finland, returned from his mission to England in the summer of 1560. He was full of praise for England, things English and the brilliant, independent Queen Elizabeth. This seems to have inspired Cecilia. (At the time, following the Vadstena Rumble, she was locked up and anything but her own person.) Cecilia wrote a series of letters to Queen Elizabeth who replied in a friendly tone, letting Cecilia know that she would be welcome to visit the royal court in London. After the Vadstena Rumble, Cecilia’s marriage prospects took a nose dive. This doesn’t seem to have bothered the Princess unduly, but was a headache for her father and half-brother. Royal marriages were means of sealing treaties of alliance and Sweden needed alliances, but nobody of much importance was interested in Cecilia now. A possible match with a Polish count came to nothing when the nobleman died in Copenhagen. Finally, King Erik was pleased to marry Cecilia off to Margrave Kristoffer of Baden-Rodemachern. 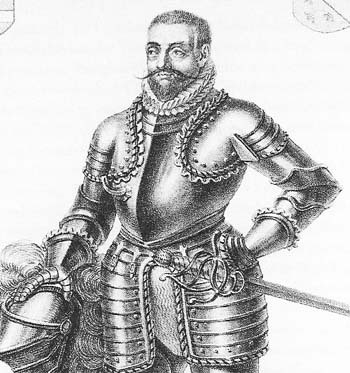 The Margrave may have been feudal lord of “a ruinous castle and 22 villages” in the Moselle valley (as one Swedish historian describes him), but he had military experience and soldiers at his command. But whatever his military prowess the Margrave is no match for Cecilia who can get him to do whatever she wants. It’s difficult to know exactly how many people the Margrave and Princess Cecilia travelled with, but they all had to fit into the one small ship. In the story the Margrave has a staff and bodyguard of German soldiers while the Princess travels with her six maids, her priest, her secretary and her English teacher. There’s also a small body of English mercenaries sent along with them by King Erik. By the time they get to London, judging by the English court records, there are probably only 12 of them altogether. Cecilia has six maids. Five are named in the sources (Fru Brita, Kristina, Kerstin, Anna and Elin). In the story the sixth is called Johanna. (Follow this link for more about Johanna.) All but Fru Brita were Cecilia’s age or younger. Properly speaking Brita was what the English court called the “Mother of the Maids” – the gentlewoman in charge of the maids. Brita was appointed by King Erik and reported to him, but once the party left Sweden that authority evaporated. Both King Erik XIV and his half-brother Duke Johan of Finland were trying to extend Swedish power around the Baltic Sea. Duke Johan may have been trying to give himself some independence from his brother, but he had begun to lock himself into a feudal relationship with King Sigismund II of Poland. In 1562 Johan married Sigismund’s sister Katarina, but less than a year later he was Erik’s prisoner, charged with high treason, and locked up with his wife in a Swedish castle. Meanwhile Erik was also expanding Swedish power in the Baltic region after being invited into Estonia by some of the local nobility. Tsar Ivan IV is about 33 years old at this point in the story and was briefly one of Cecilia’s suitors three years earlier after the death of his first wife. Ivan may not yet have acquired his nickname, but he was already a useful bogeyman to scare people with. For example, King Erik threatened to send his sister-in-law Katarina, the King of Poland’s sister, as a prisoner to Ivan. In 1564 Ivan was at war with Poland, fighting over the countries we now call Estonia and Latvia. The Swedish army at this time was composed of mix of foreign mercenaries and native Swedes. A real person I’ve chosen to co-opt for this story is Geoffrey “Siegfried” Preston. He commands the troop of English soldiers. In 1563 the real Geoffery was in London recruiting soldiers for the Swedish king. A few years later, he married Elin’s mother Agnes Knutsdotter. This scandalised the maids around Cecilia because they wrote home about it to say they had met Geoffrey’s parents in London and they were not at all the right class of people. I’ve almost no evidence for this, but it seems unlikely the Margrave would travel without some personal protection. The illustrations in the synopsis are copies of my business cards taken to the Stockholm Writers’ Festival mid-April 2018. The illustrations in the Footnotes come from Wikimedia commons. 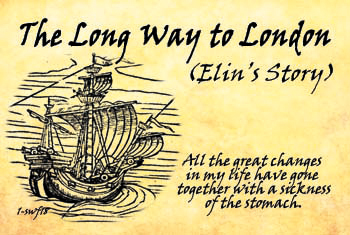 The map of Elin’s journey is all my own work.